Launching at this year's Design Week Mexico, Meta comprises a 32-centimetre-long cylindrical pendant volume made from recinto – a black stone that has been used since Mesoamerican civilisations, which flourished in central Mexico between the 14th and 16th centuries. The stone has a bubbling, irregular surface created as lava quickly cools, and was described by the studio as a "distinct and enigmatic material". "Rich nuances of dark grey are created through irregular variations on the surface," said Davidpompa in a project description. For the Meta lamp, the porous texture is contrasted with a glossy black aluminium tip. This forms both the cylindrical end that holds the light, and a circular disc that acts as a shading device to keep the stone's finish matte. 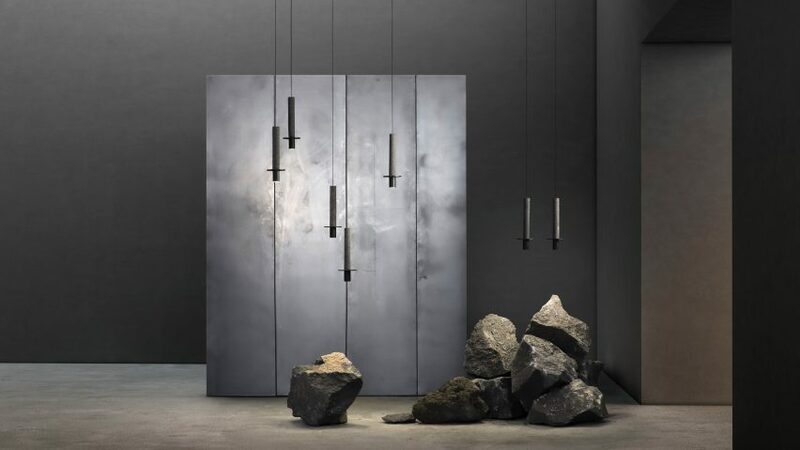 "Both materials formed into cylindrical shapes emphasise a smooth yet sharp aesthetic with a monochromatic palette of tones," said studio founder David Pompa. "The merge of finishes turns this pendant into a dark smoke delight." Davidpompa created a similar pairing for its Ambra lamp range, which combines pink volcanic rock and copper, and launched last year. Austrian-Mexican designer Pompa set up his eponymous studio in Mexico City in 2013, after graduating from product design at Kingston University in London. During his studies, he designed a collection of bizarre office furniture called Surreal Minimalism. The studio – which has another outpost in Klagenfurt, Austria – recently revamped its showroom in the Mexican capital. Davidpompa's Meta will launch during Design Week Mexico at Diseño Contenido – an exhibition which takes place from 13 to 14 October 2018 at Lincoln Park in Mexico City's Polanco neighbourhood. Volcanic rock has become a popular material for furniture and homeware, and was also used by Chilean studio GT2P for a series of boulder-like stools and British designer Max Lamb to create a set of black basalt tableware.